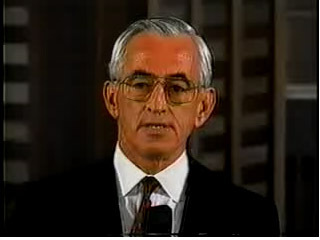 Geoffrey C. Bible was an Australian-born President & Chief Executive Officer (CEO) of Philip Morris from 1997-2002, and was Managing Director circa 1983. He is currently a patron of the American Australian Association. Geoffrey Bible circa 1994. Photo from Internet Archive. Geoffrey Bible was born circa 1938 in Australia and became an accountant. He first joined Philip Morris as a finance manager in Europe in 1968. Bible left Philip Morris to spend several years in the Geneva office of Ralph W. King Yuill, an Australian stock brokerage, and returned to PM in 1976. (USAT 6/21/94) In 1980s, Mr. Bible was Managing Director of Philip Morris Australia. He served as President and Chief Executive Officer of Philip Morris 1997-02, CEO and Chairman of the Board of Philip Morris circa 2000. He replaced CEO Michael Miles, who resigned in 1994. Mr. Bible was set to retire in August 2002 when he turned 65. As of March, 1995 Mr. Bible was President, Chairman of the Board and CEO of Philip Morris Companies, Inc.
Mr. Bible has knowledge of Philip Morris' and the tobacco industry's participation in public fraud and disinformation relative to health hazards of tobacco use, in the manipulation of nicotine in tobacco products and in marketing of tobacco products to children. Mr. Bible served as Chairman of the Board & CEO of Philip Morris Companies; President of CEO Philip Morris International and was on the Board of Directors. Bible was president and CEO of Philip Morris Companies Inc. from 1994-2000. (Reuters 6/20/94). Around April 1993 Bible was named to the newly-created post of Executive Vice President, Worldwide Tobacco, which made him in charge of the company's $12 billion domestic tobacco business. (WSJ 4/20/93). Mr. Motley [plaintiff's attorney]: Would Philip Morris agree that a single American citizen who smoked their products for 30 or more years has ever died of a disease caused in part by smoking cigarettes? Mr. Bible: I think there's a fair chance that one would have, yes. Might have. Mr. Motley: How about a thousand? Mr. Motley: A hundred thousand? This page was last edited on 3 June 2009, at 04:26.